From April 17th to April 20th, the Memphis Redbirds were in Oklahoma City taking on the Oklahoma City Redhawks. Even though the AT&T Bricktown Ballpark is two hours from my house, it should come as no surprise that I was there for three of the four games. The only reason I missed the Saturday game is that I went to the wedding of friend that I obviously like. A lot. The pictures here were taken over the course of three games. The friday and sunday night games were chilly, but I took off work for the 4:00 game on monday. That day the sun was out. The sky was blue. I got there in time to watch batting practice. In the mostly empty ballpark, I settled into my row three seat near the on deck circle. I kicked off my flip-flops, propped my legs up on the seat in front of me. I knew my shins were getting a nice sunburn, but I did not care. Warm weather, bright sunshine and baseball players preparing to play the game I love. I was in heaven. One thing I often say is when the happy times come, you should enjoy them to the fullest because there is always some problem or sadness lurking just around the corner. There in Section 113, Row D, Seat 12, I soaked up happiness with a sponge. Enough philosophy, how about pictures? The first is a picture of “the colors” being unveiled for the National Anthem. I liked how the sun shown on the flag, while all else is in shadows. I do not know who the powers that be have listed as the top prospects in the Cardinals organization, but here are mine. Conveniently, the bat one, two and three in the lineup and are all standing together as the lineups are called. Tyler Greene actually struck out in the first inning, but hit a triple in the second inning. Here Tyler Greene is on third base, while Jon Jay tries to bring him home. Last year, Joe Mather saw a good amount of successful playing time in St. Louis. He came into spring training hitting very well. He seemed a lock for the replacement third base job. Then, he got the flu, lost weight and stopped hitting. As I pondered the mystery of Joe Mather’s slump, I noticed that he still looked really thin. Too thin. I wondered if he ever really gave himself a chance a recover from his illness. It’s tough to watch a good hitter slump. Especially, away from home. When a batter strikes out, the announcer says, “That’s another Redhawk…” and everyone (not me) yells “strikeout”. And, there were the boys who sat next to me that said after seeing Mather’s sub-100 batting average, “That’s the worst player on the team.” There was the heckler that yelled to the Redhawk’s pitcher something about “his average is on the scoreboard.” Just brutal. Word from Memphis is that Mather broke out of his slump over the weekend and is hitting well once again. Hopefully, he will shut up his critics when he returns to Oklahoma City. Here Mather takes a strike. I was excited to actually catch the ball in the frame! I saw one Springfield Cardinals game last year. From that game, I remembered one player, third baseman, Allen Craig. When Allen Craig was hitting over .500 in spring training, and everyone was saying, “Who is this Craig fellow?”, I was thinking I was a pretty decent scout with good instincts because I do not remember him doing anything special in the game. I just remember thinking he was something special. I still do. Craig had some nice picks at third and he is still raking at the plate. Nick Stavinoha spent some time in St. Louis outfield last year. This year, he is playing first base and so far, he is not hitting great. As I sat in the sun on Monday, a strange event unfolded before my very eyes. Brian Barton took batting practice and went out to shag flies. A few minutes later, he was called into the dugout and did not go back to the field. When batting practice was over, I walked up to the concourse to get refreshments because watching BP is such hard work. I saw Barton in the concourse talking on his cell phone. I thought that was odd, but I just assumed the cell phone reception in the clubhouse was bad. When I got back to my seat with my peanuts, I checked my phone, and received the news that Brian Barton had been traded to the Atlanta Braves…right before my very eyes. miss Brian Barton: hitter, rocket scientist and world traveler. Here is very much the last picture of Barton in a Redbirds uniform. In Sunday’s game, this check swing was called strike three. Barton, who has been struggling at the playing, allowed his frustration to boil over. He threw down the bat, said something to the umpire and was promptly ejected. There were pitchers, too. Brad Thompson, fresh from his demotion from the Big Club, pitched a gem. He went five innings, giving up only an obligatory long ball to the short porch in left. Mitchell Boggs good start against the Cubs may keep Thompson in Memphis longer than he would like. Clayton Mortensen pitched seven really nice innings giving up only two runs, while getting in and out of trouble. It was not enough as the Redhawks shut out the Redbirds on Sunday. Here is a warm-up throw to second. He has a plus arm. In his only chance to catch a base stealer, the pitcher did not really give him a chance. The throw was on target, but not in time. I predict that Jason LaRue will not be re-signed and Pagnozzi will be next year’s backup catcher. I do not often talk about a player being hot, cute or handsome, even when I do find them attractive. I will go on and on about a great clutch hit, a sparkling defensive play or a perfect pitch because I take the game seriously and I want to be taken seriously. I do not let a player’s good looks make me think he is a better player than he is. I have years of practice making that separation…not just in baseball, but in life. However, a strange think keeps happening. Every time I see an unfamiliar baseball player and his above average attractiveness registers in my mind, he will turn out to be a catcher. It is really unbelievable. It is not like they are wearing gear when this happens. This happened at a Redhawks game this weekend when I saw an Omaha Royals player walking to the dugout. I thought, “Wow, he’s really nice looking. Who is that?” I look at my player list. Of course, it was the catcher. We all know how much I love great catching, but this is starting to get ridiculous. It is like I have an over-active catcher radar. So, it should come as no surprise, that I noticed Matt Pagnozzi, even before I knew I was looking at the catcher. Rarely does male beauty actually take my breath away, but his did. Tell me, ladies, am I off the mark? Can you not see him in a Calvin Klein ad? Thank you for allowing me my “girl” moment. Seriously though, if he had been a poor catcher, he would have gotten ugly fast. The Redbirds split the four game series with a very good Redhawks club. Cardinal fans should rest easy. The Triple-A club is packed with talent. Depth is so nice to have. did feel right to start off my season seeing both the St. Louis Cardinals and the Memphis Redbirds play two exhibition games over the weekend. The match-up took place at Auto Zone Park on historic Union Avenue in Memphis Tennessee. such as Johnny Bench, Mickey Mantle and others. the Memphis sound, music is everywhere. Also, the courtyard is graced with the lovely Memphis Redbird Red Hots. I knew I took a bunch of pictures, but even I was surprised when I uploaded them to my computer that there were 600+ taken over the course of two days. Unbelievable. I swear, I did not have my finger on the button the whole time. I actually kept a scorecard, too. But, evidently I was very busy. So, when I say here are “just a few” pictures, you will know I mean it. Everybody stops to watch Albert Pujols take batting practice. I think he could sell tickets to his batting practice to raise money for the Pujols Family Foundation. The Cardinals 25-man roster includes a number of rookies. Here are just a few getting ready to take batting practice: Infielders, Joe Thurston and David Freese, and outfielder, Colby Rasmus. I believe fellow rookie, infielder, Brian Barden was in the cage. New Shortstop, Khalil Greene, looks happy to be a Cardinal. He had a great spring training, and hit a bomb in Memphis, so we are so happy to have him. Yadier Molina heads to work. One of my favorite game sights is the catcher, starting pitcher and pitching coach walking in from the bullpen, all warmed up and ready to go. The walk means it is almost game time. In the first picture are Yadier Molina, P. J. Walters and Dave Duncan. P. J. Walters, who will start in Triple-A Memphis, made a spot start for the Cardinals in Friday’s game in place of Chris Carpenter. Walters had a very fine outing, as the Cardinals won 13-1. The second picture is Yadier Molina, Joel Pineiro and Dave Duncan. Joel Pineiro had a great spring training, and he pitched well on Saturday. He got into a couple jams, but did not loose his cool. He pitched better the longer he went. The Cardinals won 7-3. Amazingly enough, another kid walked up with a #12 T-shirt. I imagined him asking the same question. This is a nice shot of Khalil Greene , but the guy on second base got my attention over the weekend. Memphis center fielder, Shane Robinson, has a nice bat. He made a great diving catch in center, and literally climbed the wall to try to get to a Rick Ankiel home run that was long gone. But, I found the following shot of him hilarious. From left to right (field), we have Jon Jay (5’9″), Shane Robinson (5’7″) and Joe Mather (6’4″). Mather looks like a Giant. Chris Carpenter was scratched from the Friday start, which is fine with me. There is always a worry that he has X number of pitches left. No need to waste them on an exhibition game. He was reported to have a calf injury, but if he can cop a catcher’s squat to catch Adam Wainwright, the calf must be healed. Before Saturday’s day game, I was at the park before it was open. So, I decided to take a little walk all the way around it. When I got to the back of the park, the gate was open. I resisted the urge to trespass. However, I could see through to the field. I was not surprised by what I saw: Third Base/Infield Coach, Jose Oquendo was hitting early morning ground balls to Skip Schumaker. Here is a picture of Schumaker warming up later. Speaking of Jose Oquendo, late in the game on Saturday, he was sent in to pinch hit. The crowd went wild. He fouled off a couple and then drew a walk. When he took his lead at first, the crowd wanted him to steal. He got moved around to third base. He had an opportunity to tag and score on a fly ball, but evidently, he did not send himself. Ironically, he was stranded at the base he will be coaching all year. The-closer-who-must-not-be-named, Jason Motte, pitched in the ninth inning Saturday. Not to be outdone by the Cardinals coaching staff, Memphis Redbirds Manager, Chris Maloney, sent himself in to pinch hit. He made nice contact, but grounded out to finish the game. I live in Oklahoma. I know cowgirls. long best friend comes from a rodeo family of barrel racers, bulldoggers and bull riders. My sister, although a city girl in every other way, is a horsewoman who is far happier in her cowboy boots than a pair peep-toe pumps. In contrast to my sister who thrives on city life, I do enjoy the simplicity of my small town existence. But, I am not a cowgirl. I grew up on a farm. I went to Oklahoma State, home of the Cowboys (and Cowgirls). I love a good country tune, and if you want to go two-steppin’, I am so your girl. Just in case my sister ever lets me near her horse, or I need to go to the rodeo with my friend or two-stepping with you, I own a pair of cowboy boots. I love my boots however, I am not comfortable in them the way the cowgirls in my life are. I always feel a bit like I am wearing a costume. Oddly enough, I am more comfortable in my peep-toe pumps with 4 inch heels. It is wrong. No one should feel at home in those shoes. Maybe my sister’s cowboy boots are her tie that grounds her to her country roots. Perhaps, my pumps lift me out of my simple life and tie me to the city that I sometimes miss. That being said, there is no doubt that my “cowboy boots” have been “getting’ kinda restless”. Winter (meaning the off-season) has been long and tedious. I decided last year that I would organize my life and finances in such a way that I could see the most baseball possible. In the dark, cold winter, I have planned, plotted and booked. As the possibilities unfolded, I became more and more restless, anxious for the day the baseball adventures would commence. This Friday, April 3, 2009, it begins. When I first started planning, I considered a Spring Training trip. But, just getting there is expensive, with a plane ticket, rental car and hotel. Also, when I was looking at it, the World Baseball provisional roster was not out, so I did not know how many Cardinals would be gone. While I was still vacillating, I saw that the St. Louis Cardinals would play two exhibition games against their Triple-A affiliate, the Memphis Redbirds. Memphis is only a seven hour drive. No plane ticket. No rental car. Pre-season problem solved. With two dugouts full of redbirds, “I ain’t got a single thing to lose”. Redbird heaven, here I come. Although if the Memphis Redbirds beat up on the St. Louis Cardinals, that could be construed as a bad thing. Or, it could mean we have great depth. It is Spring, a hopeful time, so if that happens, I will be bragging on our depth. So, today, I am packing and preparing. The #4 Molina jersey is in the suitcase. The score cards are printed. The batteries are in the camera. Gretta V. Jetta has new shoes(tires), a fresh oil change and a new tag. We are ready to hit I-40 and go east until we cross the Mississippi and end up on the right side of Memphis. Let the baseball begin! was happy to find Redbird Chatter on the mlblog.com leaders list this week. Number 33.
a dedication to #33 Barney Schultz. Cardinals have ever had a knuckleball pitcher. Al Hrabosky impressively pulled out the name, Barney Schultz. one stone, but killing birds (especially red ones) is a touchy subject here. Great Depression devastated the nation. only finished in the middle of the National League pack. Medwick, who had 98 RBI’s and slugged .497.
those “must see” things in Memphis. After Graceland, of course. Molinas behind the plate. Heaven! enter the world in June. wounds Chicago Mayor, Anton J.
will be other baseball mini-adventures. traveling 15,596 miles in 7 days, 18 hours and 45 minutes. to Wikipedia for providing all the great 1933 facts. Sunday night, the Cardinals will be playing for the Championship! Oh, to be typing those words in October! Or, November, since the 2009 season is starting so late. The Super Bowl bound Arizona Cardinals are not my Cardinals, but they are redbirds, so I will be cheering for them. Perhaps, 2009 will be the “Year of the Cardinals”, starting with a Super Bowl Championship and ending with a World Series Championship. Ah, the beauty. The symmetry. The poetry. The hope that lives and breathes in the days before Spring Training. This summer, I am adopting a new group of red birds. No, they are not Cardinals or even part of the Cardinals farm club, but they are red, they are birds, and they are a baseball team that plays a couple hours from my house. They are the Oklahoma City Redhawks, Triple-A affiliate to the Texas Rangers, and I have season tickets. The Oklahoma City Redhawks play at the beautiful Bricktown Ballpark in downtown Oklahoma City. The three entrances to the park are guarded by larger than life statues of Oklahoma born baseball legends: Mickey Mantle, Johnny Bench and Warren Spahn. 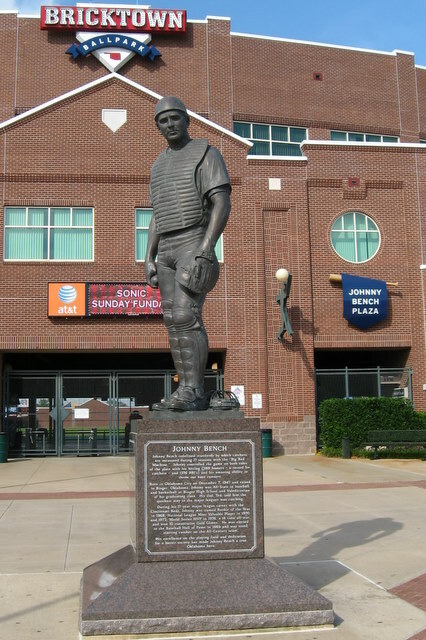 In this picture, Johnny Bench is standing watch on his plaza. Approriately, this is the entrance behind home plate. During the Oklahoma Centennial celebrations in 2007, monuments were erected to honor other Oklahoma born players: “Bullet” Joe Rogan, Paul “Big Poison” Waner, Lloyd “Little Poison” Waner, King Carl Hubbell, Pepper Martin, Bobby Mercer, and “Superchief” Allie Reynolds. So, this relatively new park does a good job of capturing the history and spirit of the sport. It’s a great place to watch a ballgame. I was at the park not long after the passing of Bobby Mercer. His monument was adorned with flowers and a Yankees hat in his memory. With the park being 2 hours away, I won’t see all 72 games, but certainly enough to justify the purchase. I can trade in my unused tickets for general admission seats and give them to friends–spread the baseball love. Of course, when the Cardinals Triple-A affiliate, the Memphis Redbirds, are in town, I’ll be cheering for them. Ultimately, a Redhawk might be a redbird, but that does not make them a Redbird! Go Cardinals!